A new video from Trevor at the Model 3 Owners Club documents the first delivery of a Tesla Model 3 in Canada. The first Model 3 delivery in the northern country is thought by many to be the start of a wave of deliveries in the back half of the second quarter as Tesla attempts to defer hitting the critical 200,000th delivery of its vehicles in the United States. When the 200,000th vehicle is delivered, the clock for the expiration of the $7,500 federal tax credit starts. The rebate doesn’t die off straight away, but instead will taper down over subsequent quarters. But if the 200,000th US Tesla is delivered on July 1st, that’s a lot better for later Tesla buyers than if it is delivered on June 30th. Tesla is ramping up staffing at its Canadian delivery centers in a move that has many speculating that a spike in Model 3 deliveries will soon follow (h/t to CleanTechnica reader and commenter “Johnny”). We’ve also seen murmuring that Tesla staff in Canada have been told to prep for a huge number of shipments in the coming months. One ambitious owner is also following up on his unofficial tour of the United States with an unofficial European Model 3 Road Trip. Check out his Facebook page for a look at the locations he’s planning to visit as he tours far and wide around the continent. Just looking over the posts makes me want to get into my Model 3 and get out on the road. I’ve had to put a pin in our road trip adventures until we get back into a Tesla and am absolutely pining for some time on the road in the meantime. The sought after Model 3 is also being imported by automotive rental companies to give locals a taste for the long-range, affordable electric car. 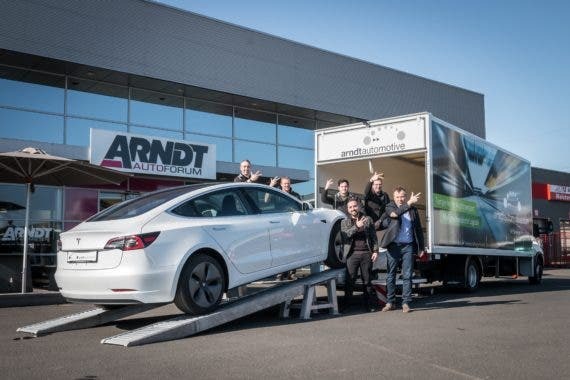 Autovermietung Arndt posted on its Facebook page and website about the three Model 3s it imported to be used as rental cars (via InsideEVs). There is no official timeline from Tesla about when it will start making deliveries into Europe, with estimates ranging from December 2018 into 2019. For the time being, Tesla is severely production constrained on the Model 3, producing only 2,622 Model 3s per week, according to Bloomberg‘s Model 3 Tracker. On the first quarter earnings call, CEO Elon Musk reiterated plans to continue to ramp up production of Tesla’s first affordable electric vehicle, but the base model of the car still isn’t available and it’s not quite clear when it will be. To keep production as simple as possible, Tesla has only been producing a single variant of the car. That variant includes: the Long Range battery (+$9,000) and the Premium Package of interior goodies (+$5,000) on top of the base price of $35,000. 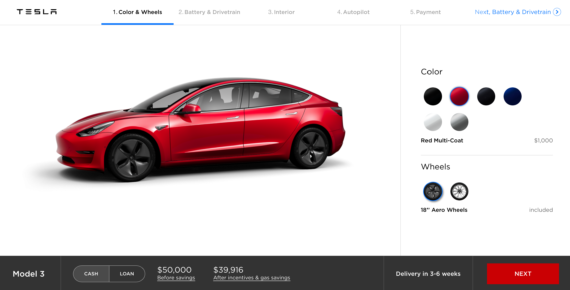 Otherwise, customers have a choice of paint color (which can add $1,000 if you don’t choose black), wheels (19″ Sport Wheels add $1,500), and a couple of Autopilot options (Enhanced Autopilot for $5,000 and Full Self-Driving Capability for another $3,000). Tesla is planning to start selling the next variant of the vehicle later this week when it is expected to introduce the higher performance All-Wheel-Drive option, which will come at yet another increase in price. The truly “affordable” base version of the Model 3 will follow a few months later in “Late 2018” for early reservation holders, according to the current estimate.